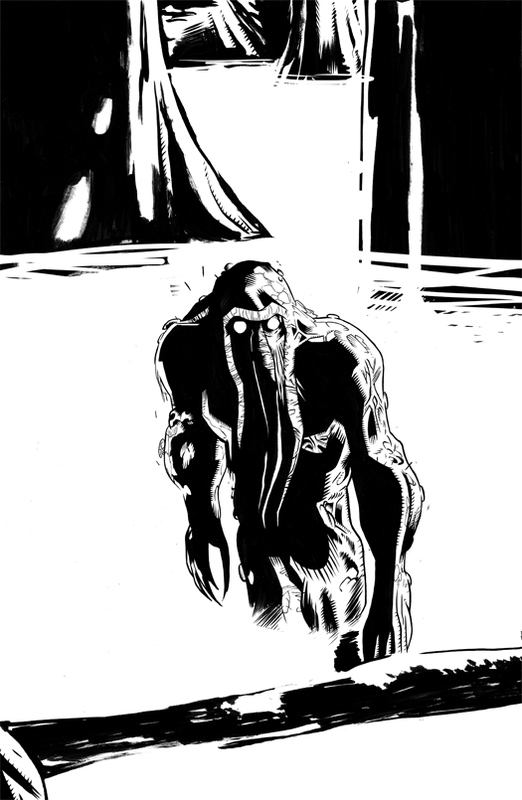 THIS MAN-THING WAS REALLY HARD TO DO BUT I FINALLY GOT MY MAN-THING ON THE INTERNET! In all seriousness, you should all be picking up Thunderbolts, especially now that our very own Declan Shalvey is on the title for the next couple issues! The first of which is on stands NOW!! EDIT for the Process Junkies: Thought it might be fun to, again, show you the inks for comparison to final illustration! When I stroked the keyboard to click on the link to enlarge it, I had no idea it would be so...big! Yes, Mitch, you truly have a Giant-Sized Man-Thing here! This is fantastic man. Bloody great job. Thanks guys! This one was a ton of fun to do! And a special thanks to Mr. Reid up there for supplying me with a ton of tombstone worthy quotes! Great, great, great Man-Thing Mr Gerads! Such a renewed look, tone and surgical color display! CLAP, CLAP! To you and all the TWARTS here! This is my first stop right after my coffee every morning!